Are We Eating Enough Humble Pie? Humble pie. An old-fashioned phrase. Makes me think of a picnic in springtime, a checkerboard tablecloth, and someone joyriding through a forest in a horse-drawn wagon. That person thinks he’s king of the world. He’s showing off but all-too-soon he hits a rock, is catapulted from his dinky wooden seat, and with arms and legs flailing catches air and unceremoniously lands in a huge puddle. Mud covers him from head to toe. Don’t ask me where I got this visual. I have no idea. But when people say, “He’s too big for his britches,” something along these lines comes to mind. In modern parlance, we’ve wrongly accepted it as having low self-esteem. It’s not that. Merriam-Webster’s defines it as the quality or state of not being proud or haughty. To be humble is also to rank low in a hierarchy or scale. To be unpretentious. Note that these definitions do not indicate intrinsic value. You can be a cog in the wheel of a large organization, but if doing your job enables others to get theirs done too, you’re not exactly worthless, are you? My grandfather used to say he was a “peanut” when he described his career as an engineer at Boeing in Seattle, WA. A former WWII pilot and instructor, he was extremely bright and capable, and held a variety of positions which relocated his family a handful of times over the years. But no matter how much I admired his work, his perspective was different. He’d grown up in the Great Depression, and lived apart from his mom for seven years on a small farm outside of Vancouver, WA with his father and sister, while his mother provided income as washer woman in Seattle. She sent money down to her family every time she got a paycheck. He never forgot arriving at that farm house for the very first time and realizing that the only running water came through a rough, open pipe over the kitchen sink, fed by a trickling local stream. Though the amenities did improve, prolonged family separation – not by choice but by necessity – and hard times, left marks. He never took blessings for granted. Instead, he took the opportunities he was given and used them to serve others. He always gave others credit and downplayed his own contributions. He was holding all things in proper perspective, the way a truly humble person navigates life. So it made sense to me, sitting at his memorial service, that here was a man who had spent his life making kind overtures. Yes, he helped feed and clothe the homeless through his church, and volunteered countless hours to manage the books for community groups. But another thing he did really struck me. In his later years, he joined a yacht club and rose ‘through the chairs’ to become Commodore. At the end of the monthly members’ meeting, he had a personal tradition of “Naming the House.” Starting on one side of the room and making his way around, he would say the name of every person present, and if there was enough time, also the name of his/her spouse and their boat. At any meeting, there might be as many as 200 people present. First, what a memory! Keeping his mind sharp was always important to him, but he must have spent days studying the roster. It shows a level of dedication to his organization that I believe most leaders don’t have. Second, he was looking at each person as he said their name and relayed information pertinent to that person’s life. How often do we tell others that they are seen? That we know them? That we care who they are? And finally, he was not doing this to show off or to elevate himself above his fellow members. He did it because he fully understood that once his term was up, he would reassume his place in the crew. Despite the fancy uniform and podium he was speaking from – he was – essentially – just like them, and he valued each of them for who they were individually. His heart was in serving them. He knew that each person was important – a valued member – and he wanted them to know that he would never forget a single one. This how God sees us. To show us that he understands, He sent us Himself in Jesus. Fully man, and fully divine, a person who was similarly tested in all ways, but remained without sin. (Hebrews 4:15) God “gets” us. True humility on our part is recognizing our rightful place in the world, which is neither less than nor greater than any other human being, but bowing only toward the One Who is. How does this thought strike you? Is it strange? Foreign? Liberating? Our intrinsic value is not defined by our position. It is not related to our income, connections, careers, or even our bad habits. We were created in love by the One Who cradles us in the palm of His hand and calls us Beloved. This is where we find our true worth. This kind of humble pie is Truth. And it’s deliciously filling. There’s a small pile of clothes on my dresser right now, awaiting the judgment of my stylist, who has been away on business for a couple days. I ordered a few fall items last week, and I won’t rip the tags off without consulting my husband first. Not because I’m looking for his permission (gosh no! ), but simply because he has a better eye than me, and I appreciate his input. I first realized this when we were dating, and he convinced me to a buy a classic navy sundress from Ann Taylor that I wore for 5 years. It was flattering. It hugged my curves in all the best places and skimmed over the less-than-perfect parts, and the color made my blue eyes pop. But I wouldn’t have picked it on my own because it was, at the time, more than I would typically spend. My husband’s fashion sense was confirmed during our engagement as I chose a color for the bridesmaids dresses. He actually knew (and could spot) the difference between cornflower and periwinkle blue. Have I told you that I hate to shop? Years later, I complained one June about needing to buy a couple new dresses, as we had a slew of Christenings, weddings, and sundry parties to attend in the following months. That afternoon, he waltzed into our kitchen with two new shifts that he had bought straight off the Lord & Taylor racks in under 15 minutes. One fit me perfectly. The other needed minor alterations at the shoulders. I told him other women would laugh at me if they knew, because they’d think I have no ability to dress myself. He shrugged. Then added, “I appreciate your body more than you do,” and smiled in a come-hither kind of way. It has taken some time, but I have accepted that my husband has a legitimate point. He values me (and my body, I guess) in ways that I don’t. And he is looking out for me and the image I put forward in the world. So – I wonder – am I doing the same for him? I might not have his same ability to find a garment that is both “on trend” and “spot on” for someone, but am I helping to create a positive impression of him for others? Do I know his faults? Should I tell you about them? In the last week, I’ve heard a few women speak poorly of their husbands or other men in their lives. Often, it’s just venting – relieving frustration that builds up in hectic times when we aren’t leaving enough space for deep connection with one another. There is a fine line between venting, complaining, and disparaging – a downward cut that slices into the bonds of love between us. We are called to build one another up, to clothe one another with affection and caring. This process happens face-to-face, and when we speak of one another while apart. Beautifully woven life stories are created when we consistently choose to celebrate our strengths, rather than focus on our flaws. My husband performed something of a miracle this week. He made bacon. He didn’t cook bacon. He MADE it. From scratch. He cured the pork all week long and then smoked it on our back porch this afternoon. When he pulled the slab of mouth-watering goodness out of the smoker, cut off a thin slice, fried it in a pan for just a minute, and gave me the sizzling piece – I thought perhaps I could live on just this for the next few years. My husband’s slab of homemade bacon. Right out of the smoker. It was a GREAT afternoon! If you’ve eaten at our home, you know my husband is a culinary wizard. I like to say that I cook for sustenance and to feed our family during the week. But on the weekend and when we entertain, the love of my life cooks for fun and relaxation. He’s made his own marshmallows, candied oranges, corned beef, sausage….even his own hot sauce (after growing his own peppers first – multiple kinds for the right mix of flavors, naturally). And these are just the things that immediately come to mind because he’s made them in the last year or two! We’ve been married 19 years. Do the math. The number of delicious meals he’s made is mind boggling! People say my guy is a “foodie,” and I guess that’s true. But I think he’s also gifted. And what that means for me and our kids is that we’re very, very blessed. If you ask him, my husband will tell you he enjoys cooking. And he likes to see people take pleasure in the fruits of his efforts. Which is the way it’s supposed to be. Because when you bless others with a God-given gift, it will bring you joy. What are your gifts? Do you know? Do you often sell yourself short? Don’t think you have to have stellar musical ability or athletic prowess to be considered gifted. One could argue that the world needs people to exercise their ‘quieter’ talents even more. Are you patient and calm when others would rush a tender soul? Do you create warm and inviting spaces where people like to gather? Are you a natural ‘encourager’? Are you good at problem-solving? We all have gifts, and no two of us are the same. Imagine if everyone used his or her gifts to their fullest extent. Your gifts were given to you for two reasons: to help build up the world, and to bring you joy in the process. That’s something delicious (like bacon!) to think about today. Have you ever revisited a memory only to discover that your recollection was, in some way, skewed? This happened to me recently. I was thinking back to when I was 12 or 13, spending a day with my dad. We were in Morocco. Epcot’s Morocco. My folks had recently divorced. At the time, my sister and I were living in Jacksonville, Florida, with my mom but for reasons I can’t remember, this day-trip to Orlando was just for Dad and me. We were having a blast – “hoofing it” as Dad always said – walking quickly all over the park to take in as much as we possibly could in 12 or so hours. Just before dinner, we stopped at Morocco, and as we admired the leather goods in the shops, I told Dad I needed to visit the ladies’ room. There, I discovered what every adolescent girl dreads. And dear God. I was not prepared. No purse. No supplies. Nothing. Feeling slightly nauseous, with butterflies in my stomach, I marched outside. Dad was standing by a dim streetlamp, basking in the sunset over the man-made lake. His forehead wrinkled and lips puckered in perplexity. Time stood still for me. Perhaps a millisecond later, he began to fumble ferociously for a quarter, patting his shirt pocket and the pockets on the front and back of his shorts without feeling anything. Finally, he found the handful of change, opened his palm, and fished out one shiny 25 cent piece. I took it from him without a word. When I returned, he was fidgety. There was a crisp air of uncertainty about him. So Dad. So typical of Dad to attempt humor just then. And I showed my gratitude with a grudging smile. We settled on Japan, where, over my first-ever bowl of udon I also felt for the first time that necessary parting of ways – the separation that comes between the child and the parent, and in this case, between a girl and her father. Things would be unsaid. Experiences would be unshared. Life would be lived separately. I used to think this story was about me and the time my monthly cycle began at Epcot Center. And it is – in a very small way. What’s more important however, is that Grace showed up that day, and taught me a lesson for life about men. My dad is a gentleman through and through. That doesn’t mean he always responds with composure or perfect words the first moment of a challenging situation; it means that he will respond correctly when given the fullness of an opportunity. The distinction is important. This little incident was a building block planted by Grace in my life. How do I know? Because my father’s response to me – initially awkward, but full of love and tenderness – was a foreshadowing of interactions I would later have with my husband. By looking back on this memory, I can see that I was being taught that today I am to give my husband room and time to respond with the love and compassion I know he has for me, even if the circumstances of any given situation take him by surprise. Men get a lot of bad press these days, and yes – there are more than a few out there who are behaving poorly and thus becoming fodder for headlines, memes, and tabloids. But I’ve been blessed to know many good men – righteous men who through their actions, big and small, show their love and concern for the women and children in their lives. Fathers especially, who shepherd their families with perseverance and thoughtfulness. They aren’t showy or prideful about their contributions; they do it out of the purity of their hearts, and we would do well to honor them appropriately and regularly for it. The love these men express is a reflection of the bigger Love – the eternal Love. The One that brought all of us into being through the free gift of Grace and uses individuals to do work in the world. Love is an unparalleled force that we cannot escape, and we desire it above everything else. Relationships with parents can be complicated. Holidays like Father’s Day can stir up a whole host of emotions. But deep within, many of us want to feel or say something more than, “Have a beer on me, Dad!” “Play some golf!” “Take a load off!” or the generic, “Enjoy your day!” Even if our dads have passed on and our interactions were troubled, we want to have hearts of gratitude for these men who touched our lives so deeply. The not-so-secret secret that Grace teaches is that gratitude is a practice that can be learned. So here’s an exercise for building gratitude for your dad (and indeed any man in your life) that you can try – today. 1) Think of time when he was tender to you. An isolated incident. 2) Visualize yourself through his eyes. Remember that you were his child. Consider how he must have felt as he looked at your face. However imperfectly he expressed his emotions for you, try to imagine the stirrings of his heart. 3) Add the emotion you feel from this “imaginative view” to your databank of knowledge about your dad. Assume his best intentions. Grant him a bit more grace in your heart and you will want to act toward him accordingly. Can the past teach us about the present? Does Grace always show up in our life’s story if we look closely enough? I believe the answer to these questions is ‘Yes.’ And we can respond with gratitude today if we can gradually come to believe that there’s a God who was walking with us then, and who walks with us still. Holy Moments. My theme for this month. I have a bunch of ideas. So many things I want to write about. Yet, I began the month by biting off a bit more than I could chew. Back on September 26, I decided on a new theme for my blog, made the big switch to a new host, and lost my old posts and content in cyber space for a few days (not before I had backed it all up on my computer, thank goodness), but still. Being on tenterhooks, frustrated by technology, was not the way I had wanted to begin 31 days of contemplating ‘holy moments’ in my life. Nevertheless, those moments are here. In the midst of our everyday. My new blog theme doesn’t look like I want it to…yet. It’s just like my life in that way…It only bears a slight resemblance to the vision I have for it in my head. Yet I know…there is good in it. God is here with me in this hot mess. And there are beautiful things He wants me to see. Like this…. 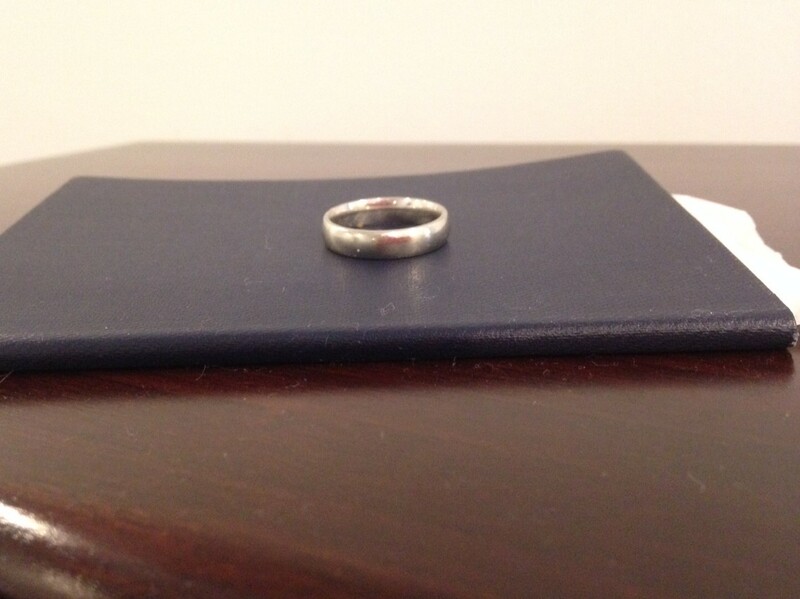 My husband’s passport and wedding ring sitting on my jewelry box today. Signs of to whom he belongs. Me. His nation. He’s on a short trip, and the tugging in my heart, which I have felt every single time he’s flown since we were engaged 18 years ago reminds me that my short-lived concerns are nothing compared to what’s irreplaceable. I kiss him goodbye. One holy moment. And then I wait patiently for the next one. A text. Four words that ease my heart. And they are not to be taken for granted. My husband and our union is not to be taken for granted. We are joined together by His design. I know that, and am glad to be reminded of it. Today, my husband and I celebrate the 17th anniversary of our wedding. As my sister-in-law was taking me to get my hair done on that bright spring morning, she gave me the single best piece of advice: “At a couple points,” she said, “just STOP. Take a look around. Take it all in.” I’m so very, very grateful that she offered me this wisdom, because thanks to her, I have several clear memories of that gorgeous day, when I so easily could have lost them in the shuffle and momentum of the celebration. I’m not even going to begin to claim that we’ve done everything right in our 17 years of marriage. And anyone who has been married for any length of time will tell you that rain will fall, floods will come, and winds will blow. Your commitment to one another will be tested, perhaps not to the breaking point, but there will certainly be challenges. My sister-in-law’s wisdom is still the one and only thing I tell brides-to-be, and I think it applies well to the rest of life too. And I’m sure you’ve heard it before, too – because we all know that life goes by so, so darn quickly. You don’t want to let precious moments with your loved ones or friends slip by unnoticed. But I would argue that stopping to take a look around is also critical for the long-term success of a marriage. When my husband looked into my eyes and pledged to be with me until “death do us part,” I could see in his green eyes that he meant every word. We both meant what we said, and still do. It’s easy to stop at the good moments – to appreciate sweetness…The feel of my hand in my husband’s. The way he always kisses me goodbye before leaving the house – for any reason, big or small. The fact that he is exceptionally good at picking out gifts for me, and at whipping up the most delicious meals. At these times, it’s also easy to remember to thank God for this good man. But then of course, storms do occasionally blow through. What I’ve learned is, they don’t have to tear us down – because in the midst of them, we can keep building the foundation of our house – brick by brick. It’s grace that taught me this – worked on me, really. A house isn’t built overnight, but when the foundation is re-fortified, it can stand for a long, long time. May ours be built stronger, again and again. This is my prayer for us, on this 17th anniversary of ours. Then he turned and headed off into the parking lot, leaving her there, moving along slowly with a downcast face. I immediately thought of my husband. I’m not going to say we’re perfect people and have never had a rough patch in our marriage, and unfortunately on this Friday afternoon, I also don’t have time to paint a full picture for you and list all of his best qualities. But I just HAD to write this. In our 17 years of marriage (plus one year of dating), he has never left me alone. Not without his love, not without his friendship, not without his support, not without his concern, not without his physical presence at a moment when I really needed him. Never left me alone. And when it comes to cars and parking lots – there’s the truth about him in a nutshell. If the weather was bad or the situation iffy, he’d tell me to stay where I’d be warm, or dry, or cool, or safe, etc. and he’d go get the car and bring it around to me. I admit, there might have been times when this was better for him (he’s a faster walker than me, and if the road is icy you don’t want to walk with me! ), but whatever the case, he’s always considering my best interests, and if the kids are with us, theirs as well. Last weekend when I woke up on Valentine’s Day, the first thing I saw were gorgeous red roses from my husband. And down the hall, my daughter saw pink tulips, from that same good man. Tonight, he will take our daughter to the annual Father-Daughter Dance at her school. It’s the fourth time they’ve been, and my little girl looks forward to it every year. This ritual is close to her heart and I know why. It’s a night where she has the undivided attention of her first love, her dad. I love this night, too, because I know that day by day her interactions with her dad form her expectations about how she is to be treated by a man somewhere down the road. Tonight she gets to practice being the apple of someone’s eye. And my sweet girl is blessed, just like me. Great question. Ever since I heard it, I keep revisiting it, because really, if I’m a Christian, does my life demonstrate my love for Christ? I thought about this question today when I opened up my wallet – not to give away money, though maybe I should be doing more of that. No, I thought about it because the light bounced off my little stainless steel cross, and the minute I saw it I thought about my dad. When I picture my dad stepping up to pay for something at a cash register, I see his gentle hands cupping three things: coins, a silver pocket knife, and a stainless steel cross. That cross. It has always been there. It serves as an outward sign of the personal relationship he’s been ready to share – freely, as it was given to him. 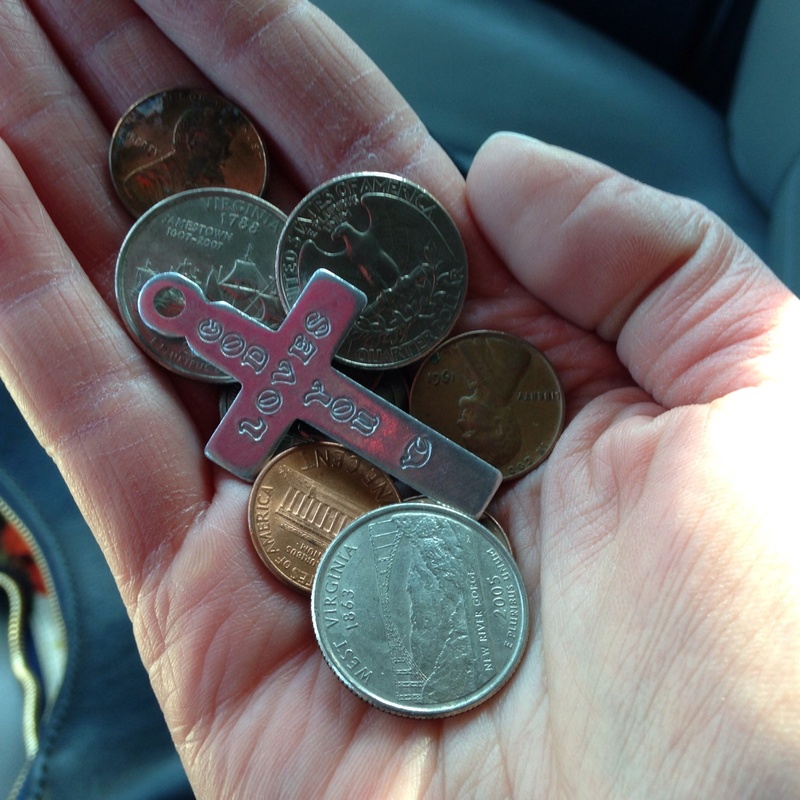 Over the years, he’s witnessed silently to countless clerks who saw that cross, one at a time, as he opened his hand to pay for groceries, meals, hardware, craft supplies, gifts, newspapers, sodas, and more. It’s evidence of a Christian that just keeps turning up, and for my dad – a reminder to himself that his God is Emmanuel – always with him. It was Christmas time, 1985. My sister and I were visiting our dad, who was living alone in Washington, DC. At that point in his life, my dad was driving a VW camper – the perfect vehicle for our excursions to Shenandoah National Park in Virginia. But this night, we had brought it to the Mall, stopping here and there to see decorations and our nation’s monuments all lit up. Somewhere downtown, we were sitting in a parking spot, warming up slowly, snug in our vehicle shelter, when a man rapped on my dad’s window, then respectfully took about three steps back. That was when I looked at him – standing with his hands folded together at his chest, his dirty clothes hanging off his slim frame, his chiseled face gray and weary. I don’t know how old he was, but he seemed older than my dad – not in chronological age, exactly, but in demeanor. He was weathered. Tired. 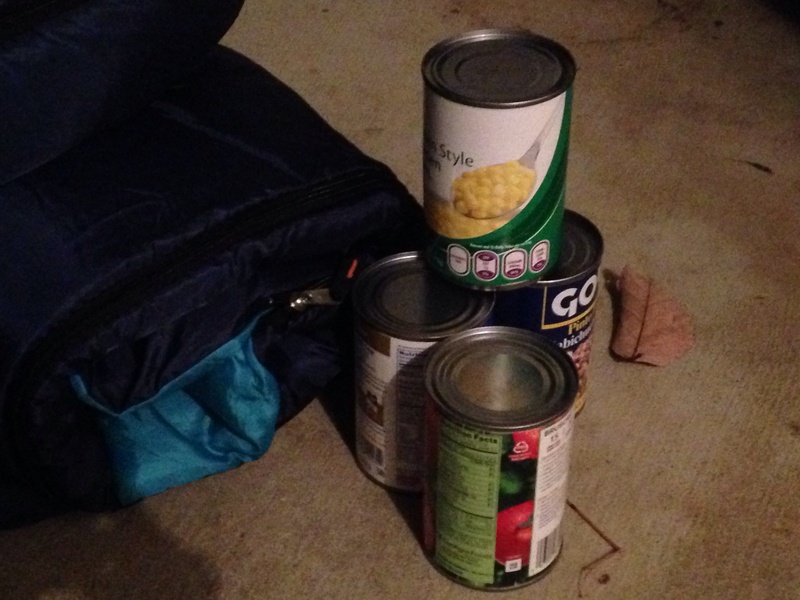 I looked and found a few cans – of beans, corn, whatever… and passed them up to my dad, who rolled down his window and handed them out to the man. “Oh,” he said, obviously surprised. “Thank you. Oh, oh, thank you,” he said, smiling now. “Umm, no sir. But that’s alright…” He was moving back again. Sure enough, there was. It went to the front and out the window. The man was turning to leave when my dad asked one more question – the one that became emblazoned on my soul. It impressed upon me for all time the difference between this man’s life….and mine. There was no way he couldn’t be. It was in the 20s. The man looked down, resigned, and shrugged his shoulders in such a way that let us know. His answer was No. Not really. I make do. I reached back behind the bench seat I was sitting on, heat from underneath it blowing out on the back of my legs, and found the navy blue sleeping bag. It too went up to the front and out the window. He was so grateful – the kind of grateful I so rarely, rarely see. And he murmured many more thank-yous as he moved away for the last time. I watched him walk away into the shadows, his arms overflowing with his newfound bounty. My dad rolled up his window and we drove home. All I could see was the back of his head, but if I hazard a guess, I’d say his blue eyes were shining – with love. Dad – You were light in the darkness, Christ’s hands in the world. Thank you for showing me how it’s done – humbly, freely, with a heart overflowing with God’s grace.